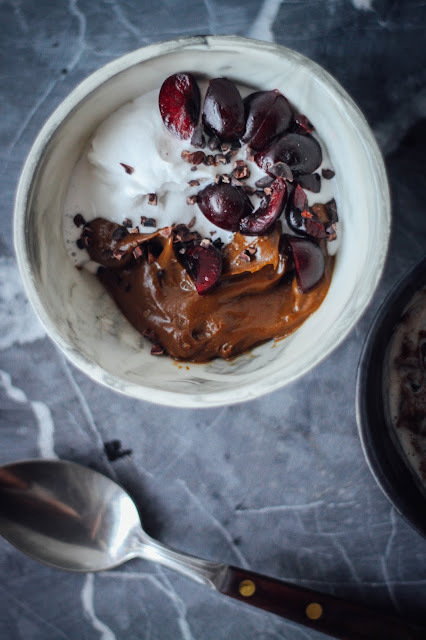 This recipe is everything you want chocolate pudding to be. I have nothing else to say for now, so talk soon. To make the pudding: blend everything together until smooth, creamy and thick. Adjust according to preference. 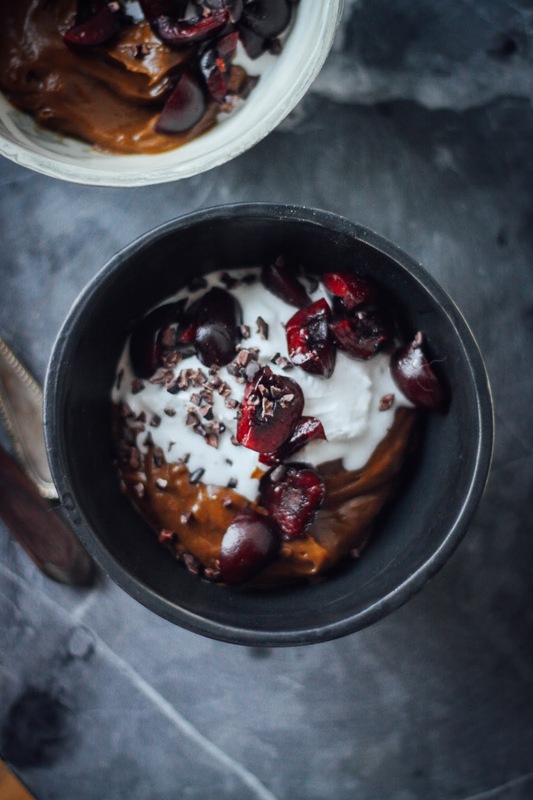 Serve in bowls with whipped coco cream, cherries and cacao nibs. Nom. My only issue is the use of syrups. I've been researching fructose levels, and the bottom line is even so called "healthy" sugars and syrups just aren't! Fructose, ie fruit sugar, names up 50% or more of these sweeteners and yes, that's not going to make a happy liver. It causes high blood pressure, is linked directly to cancers and strings of other issues. I adore your blog, I want to vote for more recipes with only natural fructoses - ie sweetening with figs, dates, raisins etc? Pretty please?! Ok, I have a serious question *please don't get offended*--I'm new to the whole raw food diet and to be honest, am doing it mainly to lose weight. I see your recipes and youtube videos and how virtuous your diet is and how religiously you work out. My question is, how can you eat like this and work out like you do and not weigh like, 2 lbs? Don't get me wrong, you look awesome, but I don't know if a raw vegan diet is worth it to me if it's not going to help me healthfully drop pounds. Thanks in advance for your input. Lovely. Beautiful, simple, and elegant. This is something I would make on date night, cuz it also seems so luscious and romantic - plus this time of year I can't stop myself eating almost a pound of cherries per day. Thanks, Emily! I want to eat these chocolate pudding bowls forever and ever and ever. These look out of this world! !